Dr. Mer explains that, in the absence of DNA damage, 53BP1 is inactive—blocked by a protein called "TIRR." Using a visualization technique called X-ray crystallography, the authors show that TIRR obstructs an area on 53BP1 that 53BP1 uses to bind chromosomes. But what shifts TIRR away from 53BP1, so the repair protein can work? "Our study provides a proof-of-principle mechanism for how RNA molecules can trigger the localization of 53BP1 to DNA damage sites," says Dr. Mer. 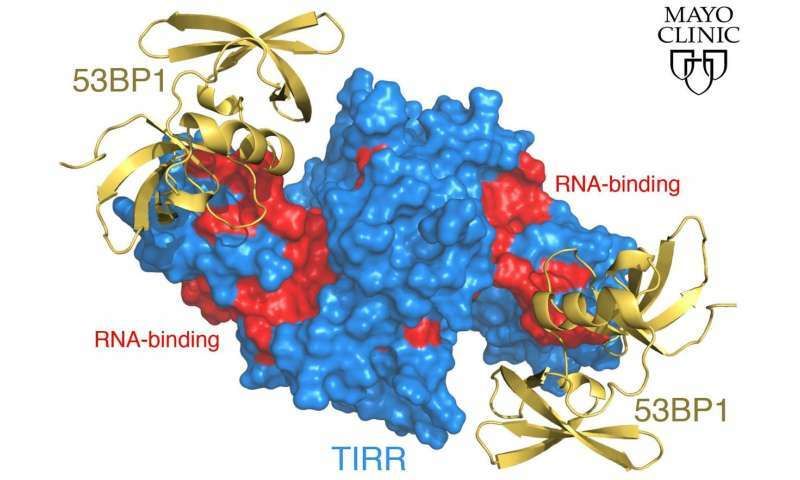 "The TIRR/RNA pair can be seen as an off/on switch that blocks or triggers 53BP1 relocation to DNA damage sites."